Everyone who knows me knows that I love Shammi Kapoor more than any other actor, even SRK. Many people don’t get it, and I can understand why, because I did have to see a few of his movies before it clicked. But once it clicked — it really clicked. I would rather watch Shammi in a bad movie than many other actors in good movies. I am not saying that Shammi didn’t make good movies — he did! he did! but even his bad ones enthrall me. I simply can’t see too much of him prancing his nimble way through a film. He seems so uncoordinated at first, but you notice gradually how really graceful he is. He can twist and turn his large frame through any number of contortions without losing his balance; he can pirouette along a narrow fence without falling. He flings himself with enthusiasm into every dance and every stunt. And he is so joyfully and openly enthusiastic and vulnerable as he chases his heroine through the first half of every movie, and so meltingly romantic when he finally wins her. I love that he actually looks like he is singing as opposed to sleep-walking through a lip-synched song. I love his green eyes, I love his nose, I love his smile and his floppy hair. I love how crazy he is. He is never afraid to look foolish or silly. He has an insouciant little-boy quality that makes you want to forgive him anything. I love his nutty outfits, his loony hats, his weird faces. In the same movie, he sings a love song (“Tumne Mujhe Dekha”), secure in the knowledge that his girl has forgiven him when in fact she hasn’t (she’s been duped by bad girl Helen); it breaks my heart, he is so transparently happy, but I know everything is about to come crashing down around him. 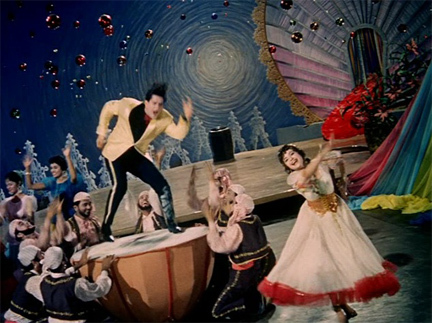 “Aaj Kal Tere Mere Pyar” is a sizzling dance number, and even at the age of 37 Shammi had no trouble keeping up. Shammi melts my heart, makes me smile, makes me shake my head, makes me want to dance. What more does a girl need from her favorite movie star? Posted on August 24, 2007 at 5:49 pm in Hindi film history, Hindi movies, Yahoo! Shammi! | RSS feed You can skip to the end and leave a reply. The only movies I’ve seen him in is Kashmir Ki Kali, and the one where he has a poor orphanage home (I can never remember names). I think I know what you mean. To be willing (and able) to make a fool of yourself, without losing your dignity is truly a talent in this world where we’re all supposed to be perfect. Love that nose ring in the third picture. Brahmchari is the orphanage one :-) you need to see more Shammi!!!! I was just told about your completely superwow blog by Filmi Geek! (“Superwow” being, of course, the very highest Bollywood-related compliment. I can’t remember what movie the word is from, sadly.) I have never seen any Shammi movies – though Shashi has captured my heart utterly and completely – but a copy of Teesri Manzil is on its way from a friend in Germany. I’ll come back to compare notes! Beth, please do come back and let me know what you think of Teesri Manzil. It’s a wonderful movie! I’m glad you fixed the comments because now I can come back and leave all the comments I wanted to leave a couple of days ago. This post is such a lovely tribute to Shammi. I am, after several films, starting to appreciate Shammi’s unique qualities and abilities. His energy is immensely appealing and he is skilled at physical comedy – what seem on the surface to be spastic gyrations are actually remarkably controlled. His characters are definitely in the “stalker romance” mold but somehow when he does it, it’s sweet and appealing rather than creepy and annoying. The film that started to turn the tide for me was *Kashmir ki kali* – then I watched a portion of *Teesri manzil* when I was tired, and decided to stop and save it for a day when I could really pay attention. I’m looking forward to it. Oh…another favourite! Teesri Manzil was such a gripping tale, full of romance, heartache, misunderstanding and suspense…my mum used to call Shmmi”that head breaker” becos of his unusual head shakes while dancing…he was great! Daddy’s Girl — I see you feel the same about Dharmendra as I do about Shammi — i.e. even though he’s 76 I would still throw myself at him :-) You should see more of him, especially some of the films mentioned here in the comments and in my post. Indyana — I bet he has broken some things while dancing! Carla — hope you are closer to “getting” him now. It’s so worth it! Have you seen any of Shammi’s more recent films? He’s done a few as recently as the 90s. Double the waistband and half the zaniness, but still fun nonetheless. My first Shammi movie was actually Parvarish, which I hardly think counts. He’s so…boring in that, even though it is a superwow wackadoo masala good time. (It totally has the Recommended Masala Allowance.) But now I’ve seen Teesri Manzil, so all is right with the world. 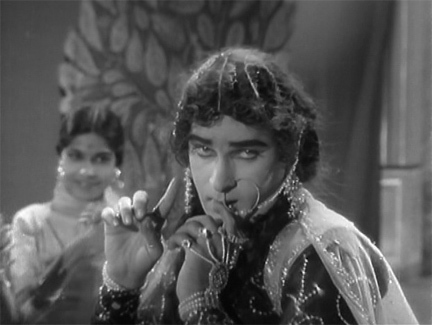 ‘Brahmachari’ was the first movie I ever saw in my life, as a kid of 3-4 maybe. Atleast, the first one I remember. And Shammi Kapoor became my favourite film star, and remains so to this date. I think, it was his irreverence, his naughtiness that took my childish heart then. And ‘Teesri Manzil’ of course is the best. Since you are such an ardent Shammi fan, I wonder if you have seen the movie Andaaz, a 70s movie that has shammi, hema malini and Rajesh Khanna in a short by very famous role esp the song ” zindagi ek safar hai suhana”. The movie also had simmi in a short role. The main lead characters are shammi and hema malini. This is one movie where shammi is so natural in his acting that he makes you feel his pain! I love Andaz…the scene where he tells Hema that he loves her always makes me cry! and the music is superb. Yes that is the scene I was referring to! An Evening in Paris is another shammi movie I have seen thrice! – sheerly for the melodious songs. Hope you have seen it too. Yes, I have seen Evening in Paris….a fabulous travelogue it is too! Hi , I used to bunk school to go to see ANY Shammi Kapoor movie – even the ones before Tumsa Nahin Dekha- the ones in which he used to have a thin moustache. What amazed me was the transformation from the flop star to the Super star ! And I used to hero worship him. Till today I do not miss any opportunity to see his films. My wife , who is not Indian , tolerates with a smile my crazyness about my idol. I eventually lost count of how many times I saw Junglee ( would not be less than 50 ! ) Professor , Dil Deke Dekho , Teesri Manzil , China Town ( one of the best B&W movie after he shaved off his moustache) and quite a few more of his films are the ones I repeatedly go on watching even after 40 years. The first reply to my fan mail I received from him was 40 years back ! And the other day , 3 years back , I sent him an e-mail and prompt came his reply ! Dear Probal, I was just reading your comment about Shammi Kapoor. I used to bunk school, like you. I have done it many times and I am not embarassed to say it. I remenber once when China Town was released, the cinema was full of school/ college kids. After many years I am now beginning to find out more about Shammi. It seems that there is a tremendously revival of Shammi craze amongst the new generation. I can proudly say that I was the first person one who started the Shammi Kapoor Fan Club back in the sixties. This was many thousands of miles away from India. Thanks for your comments, Probal! Tell your wife that this non-Indian loves Shammi too. I too sent him an email a year or so back, and he responded very promptly and very sweetly. He once said in an interview that he always does respond to fan mail. I was v.v. happy to see him when Aamir Khan released the music for TZP at his home. It’s nice to see that he looks healthy and happy—and he’s still handsome to me! What’s his email address? I’ve tried to email him a number of times using the email address on his website, but it keeps failing to deliver. The email address on his site is the one I used. Maybe it’s an issue with your mail provider? Speaking of Shammi…I was a a bar this evening and next to me was a charming older man and we were chitchatting, and he told me his name and that he was from Morocco. His name was Muslim, and I’m always looking for a chance to say “Adab” and the accompanying movement of respectively holding my palm near my fohead and bringing it down as I repeat the “Abad,” you know how to do it. I know it’s an Indian thing, but, you know he was 1/2 Muslim and I thought hey, maybe people from Morocco just may also do it, so I asked, knowing the answere would most likely be no. He said no, but it was my “in”: “Hey, did you watch bollywood movies as a kid in Morocco?” OF COURSE HE DID! And his favorite actor is who Memsaab, who? Of course Shammi! I’ve only seen “Bramanchari”(LOVED it!) and have had “Teesri Manzil” on my “Must watch” list for quite sometime. So this gentleman’s favorite movie it seems of all time is “Dil Deke Dekho,” which I’ve also heard of a lot and want to see. His other favorite is “Junglee.” He was full of such passion over “Dil Deke Dekho” and its music that he told me 2 stores where I could buy it and said, “If you can’t find it I will buy it for you.” Now that says a lot for his love of Shammi. So here I am online looking up Shammi in order to get on board, and am happy to find that you’re 4th in the google queue, due to your love for Shammi. I understand the appeal of his nose, it is so lovely and beak like, almost like an eagle, so regal! I have seen all his movies available on DVD (at least the ones where he is a hero), and I have never been disappointed. You need to see all the movies our Moroccan friend mentioned for sure. Junglee is great (in spite of Saira Banu) and Kashmir Ki Kali is right up there too. What a man! Charming, energetic, wonderful dancing and prancing, “singing” with so much emotion, what more does a girl need? He takes all our hearts away, and sets very high standards for what it is to be a male specimen! I am his really big fan, He rules! He is my most favorite actor, i have left my many favorite but still he is the best actor for me. Thanks for writing such a good article. I WOULD LIKE TO HAVE THE E-MAIL ADDRESS OF SHAMMI KAPOOR. MY WIFE OF 54 YEARS IS GOING NUTS FOR HIM. I emailed him at the address on his website (I’ve got a link to it in my Favorite Links sidebar). Someone has since said that it doesn’t work, but it did a few years ago. Yes, Shammi’s face and Rafi’s voice are kind of inseparable for me too. They worked very closely together on songs, apparently Shammi would explain to Rafi how he was going to act it out and then Rafi would match his voice to Shammi’s actions. in his footsteps and its the biggest part of my life and success..
i enjoy this site very much i like old indian movies and in this site i really very enjoy to see pictures of shammi kapoor asha parekh and other stars pics.my request please add more pictures of old indian movies such as phir wohi dil laya hun,door ki awaz,and add asha parekh movie pic waheeda reman,vyjantimala,madhubala. in a bad flick is better than anyone else in a good one. Ritu, I’ll fight you for him! :-) I’m dying to see Rail Ka Dibba (with Madhubala, right? ), did you find it on VCD? It’s hard to find a great many of his older ones any more. Sadly, I only became acquainted with him a few years ago so you do have many years up on me of Shammi love! I emailed him at the address on his website (link is in my sidebar). Someone I think said that the email address no longer works, but it could have been a problem on their side. He did reply to mine. Wait a second….he replied to your email and you just say it so nonchalently like you brushed your teeth or something…come on, what did he say, the man we would all love to talk to….I have many questions for him! But I like your assessment of him at the top. I only recently fell in love with his on screen character and thought the perfect significant other would be like that character. Always jovial, never depressed, always able to make you laugh and best of all the innocence! A lot of his older movies are not available. Do you all know about shammiweb and his facebook page? He always replies to his email, he says! :) It was a pretty standard (I imagine) reply from a movie star to a fan—thank you, I love you too, God bless…something like that. I used to really want to see his older films, but the ones I have seen have been unrelentingly depressing (and one I couldn’t even finish, it was so bad)…My earliest favorite is probably Mem Sahib with Meena Kumari, and he played the bad guy! 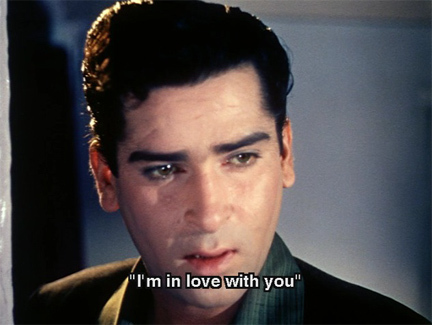 I would so much love to talk to Shammi Kapoor. Or just e-mail him. Have been a HUGE fan since my childhood. And I know EXACTLY what you mean with that walk of his in that queue in Teesri Manzil. That is soooo Shammi…you just cannot get that from anybody else. And in “o haseena zulfon waali”, he also has this style which is really something special. And in many other songs too. “Aaj kal tere mere” from Brahmachari was another one with Shammi at his dancing best. I love even “khuli palak mein jhootha gussa” from the same movie. Many many more songs. Dil deke dekho, Boy Friend, Kashmir Ki Kali, Evening in Paris….and many more. “Badan pe sitaare” from Prince. And this when he was actually well past his peak IMO. But I will never claim to be his biggest fan. That would be an insult to you – and to many others. I will just say I have always thoroughly enjoyed his acting, even if not all his movies had much novelty in their storyline. Just the fact that Shammi was in the movie was definitely good enough a reason to watch it. And I must mention Rafi saab. What a glorious voice for Shammi. Have still to see many Shammi movies but my top 3 from what I have seen are Teesri Manzil, Brahmachari and Professor. These are movies that not only have lovely songs (many of his movies do) but I also liked the storylines a lot. Thanks for this wonderful write-up on him, Greta. He is an icon in Indian cinema. And is more than just a star. He has won the hearts of millions worldwide. Raja, you must see Jawaan Mohabbat and Dil Deke Dekho. If you go join the shammiweb in Yahoo Groups, I have placed a fan video and stills from Dil Deke Dekho that people rarely get to see. Also on Facebook, do a search on China Town and there you will see some nice screen captures that people rarely get to see as well. Let me know what you think of the fan video. Also if you email him, would you please cut and paste his reply here, unless it is personal and you don’t feel like sharing…entirely understandable…. Thanks Hema, Will check out that site. I have seen Jawaan Mohabbat and Dil Deke Dekho. Loved them. Have yet to see China Town. Am planning to see Jaanwar today. Btw, Greta, I have finally started doing some translations of Shammi songs and have sent them to Atul. You will find them on his site. I am not an expert in translation. And it is more a contextual translation than a literal one. Some of the meaning is of course lost in translation but I hope it is at least useful for some non-Hindi speaking fans of Hindi songs. I know if I loved listening to a song, I would love to know more about what it says. Of course I love translations of Shammi’s song, and my favorite lyricist is Sahir, I’m always disappointed when his songs are not subtitled. I think contextual translations rather than literal are always the best way to go! It’s a lot of work, so I thank you for your efforts! I sent an e-mail to the id mentioned above – and I got a reply !!!! I had sent him a long e-mail (I really need to learn to be precise). But I think he read the whole thing because towards the bottom, I had just mentioned my blog, in case he had time/interest to read it. His reply was very brief but I am very happy to receive a reply at all. Really nice of him. He wished me all the best and said that he would visit my blog one of these days. Still not got used to the idea that I actually got a reply. LOL, I told you so!!!! His replies are brief, but always so sweet. I write on and on and on too—just like I do here—but I always feel that he at least scanned the whole thing (which is more than I can say for most of my coworkers, ha ha). You guys are lucky. I sent him an email on Friday and still no reply. I wonder if I said anything to tick him off….or maybe everyone in the world reads memsaab’s story and sent him an emal. So his box got flooded and he will take a while to respond?? I can only dream it’s not me. Did anyone see Jaane Anjaane? I disliked the ending. Poor Koili. She was left stranded with no one in the end after helping out Shammi’s character. He was also visibly fat in this one…but Leena Chandavarker was good! You’re right Hema. The ending of JAANE ANJAANE has been messed up. They could have come out with a happy ending. Hema, let’s not discuss about Shammi Kapoor being “fat”. Leena Chandavarkar was very young at that time and naturally she looked beautiful. Yes, Hemaji, in his last films as heroes Shammi Kapoor does look slightly different. These films are: PRINCE, TUMSE ACHCHA KAUN HAI, ANDAAZ, SACHCHAI, JAANE ANJAANE, etc. The year 1964 he looked his best, e.g. in RAJKUMAR. 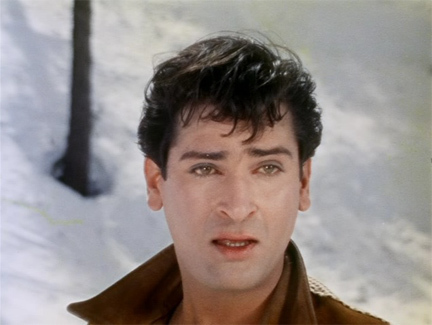 Shammi Kapoor will always remind us of romance, good looks, adventure, a bit of idealism, comedy and lots of music. We like an actor for his acting ability. Right. But Shammi Kapoor was so great looking in a lot of movies that it does become a disapointment from that perspective. Of course once the movie starts you get into his acting and forget everything else, true! Also am a fitness trainer by profession so I always feel I can help people be at their healthiest. Professional hazard. naheen chaahiye = should not be. In other word, The image which is there (i.e. which we formed first time in our mind) should never be erased. Yes, it’s understable that as a fitness trainer you want the people to be at their healthiest. That’s not easy Hema. This is because despite knowing all the fundamentals and basics of healthy living, man is also governed by circumstances which immobilise him. The immediate case that comes to my mind is that of Shashi Kapoor who has bloated beyond recognition. In my opinion, as long as his wife, Jennifer, was alive, he used to be slim and trim. I’m sure she must be making him do all the regimen to keep him fit. In her absence, I’m sure he must be a dejected man. I may be wrong because it is just a conjecture. But after 1984 hardly he has made mark. Now, maybe you’ll ask in that case what about Shammi Kapoor who has his wife around. Shammi Kapoor married Neela, his second wife, in 1969. So there is a reason for his more pep and energy. But his best was behind him. Sadly, Geeta Bali had died during his Teesri Manzil days. I can’t believe that Helen and Shammi didn’t have an affair. Come on, she is in every of his movies, they share the same birthdate and they are both very attractive….just joking. I am sure they are good friends, but I think they would have made a good pair. I would weaken and chase after Jawan Mohabbat too, but I am trying to discipline myself to one new dvd a year, otherwise I could blow a wad of money and then have less to look forward to next year! Crazy me!! Someone is singing my song here. And I like it. It’s great to know that the younger generation too find Shammi Kapoor irresistable. Amazing! I enjoyed reading these comments. I am a big Shammifan and I have been for many years. I started the first fan club in the 60’s when Shammi Kapoor was the most popular Indian actor in the world.He had a more international appeal than any other actors at the time. I recently saw ‘Professor’ after many years and it was unbelievably superb, the songs still sound terrific. I saw this in youtube. you might know about it already anyway. Geeta Bali was simply gorgeous, impish and peppy! Oh yes, I have the film…it’s an okay movie, but a GREAT song with Geeta and so fun to see them together on screen! And to think I’m looking at a thank you note he recently wrote my dad. He’s a sweet old man. But I haven’t seen any of his movies. *Feels sorry for you* :) He is a sweet old man, although he’s younger at heart than many younger people I have met! my request is please add movie picture of door ki awaz saira banu and joymukerji please add lots of pics from door ki awaz,ram aur shyam,naya daur,phir wohi dil laya hoon,and also add full story of these movies.thankyou. STILL NOW NO INDIAN STAR CAN DISPLAY SUCH A GLORIOUS DISPLAY OF ONESELF ONSCREEN. WHAT A FOOT TAPPING SONG AND HOW BRILLIANTLY HE ACTED. MERA LAKHO SAALAAM TO THAT GREAT ACTOR. Professor lal chari layke kasmir ki kali ko dudhne gaye. Brahmachari was Shammi at his finest I think – main gaauun tum so jaaoo was simply sublime, both versions. The pairing of Shammi’s acting and Rafi’s voice was pure magic. I am a pathan from Afghanistan. I love Shammi more than anyone else in this world. He is the unique personality and very different from all bollywood actors. I have watched all his movies and found every movie more interesting than the other. Every day I make a search about him on net to find out new things about him. Is there anyway to contact him by any means????? I wold love to talk to him and write him E-mails. I did send an Email to him through a website, but never heard back. I hope some one can guide me. You can TWITTER him at @shamsheraj and he replies to as much fan mail as he can. HOnest. Wow, thank you Hema for your wonderful advice. Of course I will try what you said and hope that I can get through. Are you his fan too??? I could not get through @shamsheraj , because I am not located in India. I was asked for a telephone number and my Kabul number didn’t work. Why isnt Shammi ji replying??? I have been sending him like four messages until now !!! He is a busy man, and he gets a lot of email and twitter messages! He has many, many fans across the world—like us :) So I am sure it’s not possible for him to answer them all. He also has dialysis in the hospital 3x a week which cuts into his time. And he has a lovely wife to look after too! So be patient. Thanks Memsaab. Do you think I should continue sending him messages? It is going to be disappointing if I dont hear from him. May be he doesn’t like to be in contact with pathans, hahahahah. Heeeeeeeeeeeey guys, Iam so thrilled! Shammi Ji just replied with love. He is incredible! Can some one believe that there are still some youth in my country who copy Shammi ji by making their hairstyle, dresses, behavior same as Shammi ji in 60-70.????? Allah onko Mahfoz rakhe har bala say, har bala say. I am glad to hear it Reshtya :) He is one of a kind, our Shammiji! Thank you meemsaab for your good wishes and the guidance that helped me reach shammi ji, the legend of Indian cinema. My wholehearted appreciations and thanks also go to Hema for the encouragement and providing me with Shammi ji’s twitter ID, for which I was look for since a long time. The movie, Professor, of Shammi ji is a master piece by all means and the role he paled is unprecedented. I have watched this movie more than 50 times so far. Every time I watch it, it feels like i should watch it again and again. I got kinda obsessed with. Shammi ji’s movies are really mind blowing. Yes Reshtya, I believe Professor is the best of Shammi Kapoor movies. Shammi Kapoor should have got the Filmfare Award for that movie! Professor is great in all departments of film-marking. I’ve already mentioned in these columns somewhere how this movie impacted me. I believe, Professor can beat hollow any other romantic movie made today. The proof of pudding is in the eating. Watch it any time and the movie pleases us! I wholeheartedly love the songs of professor, especially the YE OMAR HAY KYA RANGILY… where shammi ji acts as an elderly dancing professor. It is both fun and a lesson. Thinking deeply, it very well reminds us of our past and future and the changing circumstances that goes along with the age. My very best wishes to all Shammi ji’s fans! Also the song Kissssss, Kis Ko pyar karon….. isnt it extermely lovely????? Oh my God, I cant really stop watching it in my work, at home and in my car. I love Shammi ji’s English. He speaks fluently using the native vocabulary. Has anyone, watched the Shammi Kapoor Unplugged??? I love when shammi ji palys the role of a pathan. He displays it as if he really is. Very unique quality of him. He has the best songs in Hindi cinema. I am an Indian. I found your page while googling for Shammmi Kapoor. Have a great time…..
Hi Amar and welcome :) Any fan of Shammi’s is a friend of mine!!! On unplugged you explained in detail how Nargis had purchased and presented you with your first gramerphone and records and the influence this had on your life. I therefore got interested in viewing Nagris and big brother Raj Kapoor movies and found something interesting. In the introduction at the start of all his movies Raj Kapoor projects Nagris’s name before his very own. Why is this? when I am down and depressed, sometimes tired after a hard day at the office to relax I simply slip in a Shammi Kapoor movie into the machine and I am soon recharged and refreshed. It works better than vitamin E.
As a matter of surprise, my kids get more interested than me in Shammi ji movies and roles. Some times when I play with my computer, they come and say, papa, could you plz play a song of your favorite hero ” Kabhi na Kabhi, kissi na kissi del lagan pariga” He is known to my kids as Kabhi na Kabhi. I am so disappointed by the fact that Shammi Ji’s twitter site has been password protected now. I am sending A REQUEST but can not get through. Any one on this page has any idead as to how to get in there again? Just to let you know all that Shammi Kapoor unplugged episode 25 has just been finished and it is really really interesting to see all of them. Please take a look and see the real Shammi ji explaining himself and brings up golden moments of his life. Any fresh news about Shammi ji ??? Very sad news today. Shammi Kapoor has passed away. It had to happen sometime but I’m still lost for words. R.I.P, Shammi saab. You will be remembered not just for what you were on-screen but for what you were off it too. Your life is an inspiration for many, across generations. Thank you SO much for leaving us with so many memories. LIke I said, I’m lost for words. And I rarely am. Maybe more later. As soon as I heard the news.. I went to Memsaab’s site.. a true legend and a source of happiness for millions around the world.. Came back to read this post and to be reminded of some of the things that made Shammi Kapoor such a special actor. Thanks for sharing your love for him so much on this blog, Memsaab! I’m so glad that you got to meet your favourite hero in person too. Shammi will never be forgotten. RIP, Shammi Kapoor ! He is a legend for all of us, and especially so for the regulars of this blog. We cannot forget him, for the simple reason that we remember him everyday, and will continue to do so. Very nice tribute Memsaab. I too came here first when I heard the news. Shammi. Finally with his true love Geeta…And yet another star in the night sky! As every one else, I am so saddened by the news of Shammi Ji’s death. He was unique in every term and the film industry will have no actor like him in centuries. As soon as I heard the sad news about Shammiji` I thought of coming to this site at morning 9`o clock, But didn`t feel like writing anything about the sad news. something prevented me, to write about the news. It HURTS, while I remember his smiling face. Very sad news. I grew up with him. His Dil Deke Dekho was the first movie I saw without telling my parents. Have enjoyed many times ever since. The way he jumped into gadgets ans internet was simply amazing. Oh my :-( Through knowing you memsaab, I’d come to know so much about him. Thank you for that. And I am so sorry. I heard the dreadful news this morning about Shammi. My eyes were full of tears but I managed to contain myself. He had been such a great influence and had a lot of impact in my life when I was growing as a teenager back in the sixties. The first Shammi Kapoor film I ever saw was ‘Tumsa Nahin Dekha’, I must have been about ten years of age. My life has never been the same since. His style of acting, the way he dressed, his music and songs were all unique. He basically appealed to the westernised youth in the 1950’s and 1960’s. He was so far ahead of his time. The most amazing thing about Shammi Kapoor is that he had fans and admires in most parts of the world. His fans were not necessarily Indians. He will remain in Indian history as one of the greatest entertainers ever produced. He will be remembered for a very very long time. The death news of Shammi uncle was so saddening for me and the entire world. Bollywood would never ever recover the loss. His place will remain empty in Bollywood but his unforgettable memories will remain everlasting in hearts. Now that shammi ji is no longer among us, would you still continue this site, or would it get closed? The site should not be closed. His memories live on. I think memsaab and nazirji were talking about some old movie where they thought that Shammi had played a small role as villian. That the bad guy in the film looked like him. Which movie was that? I love Shammi ji in any role and in any figure. 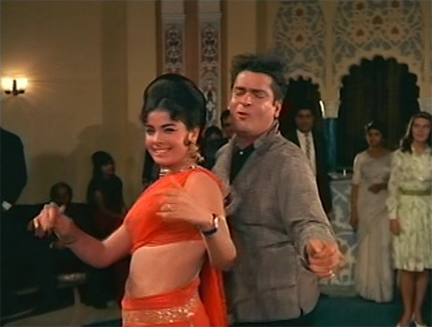 I even keep the movie Naseeb for Shammi ji’s short appearance in the song Jhon Jani Janadan…. I heard Shammi Ji’s son Aditya is making a come back to the film industry soon??? Memsaab.. Keep your site always going… more and more people will get to know this adorable, sweet personality…. Our beloved Shammi :) Thank you for all your reviews.